Even before the center was completed, both Cher and Depeche mode performed on the skeletal stage. The Grateful Dead pianist played his last show there before his death three days later. Disturbed filmed their iconic “Down with the Sickness” video there as well. 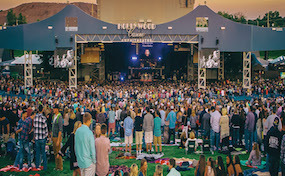 The Hollywood Casino Amphitheater has become a legend through both performers and video. AmphitheaterStLouis.com is not affiliated with any official website or primary box office. We are independently owned and operated concentrating in all sales in the secondary market. Tickets may be above or below face value. All tickets come with our 100% authenticity guarantee. To order all Hollywood Casino Amphitheater St. Louis events simply click on the show you wish to attend or call our operators at anytime.